If you thought Apple’s 2017 iPhone naming scheme was crazy, then wait until you see Apple’s 2018 iPhone names. Given all the leaks that we saw in the last couple of weeks, we had a feeling of what Apple would call the 6.1-inch and 6.5-inch iPhones since an Apple mistake allowed everyone and their grandmother to learn that the 5.8-inch model will be called iPhone Xs. But with a few hours to go until Apple unveils the 2018 iPhones, a second Apple mistake was spotted and it’s enough to confirm the news from previous reports. To recap, Apple will launch three new iPhones this year including a 6.1-inch LCD model, a 5.8-inch OLED phone, and a 6.5-inch OLED version. We already know that the 5.8-inch handset is called the iPhone Xs. The 6.1-inch version has been referred to as iPhone 9, iPhone Xr, and iPhone Xc in recent leaks and rumors. And we reported that the 6.5-inch iPhone wouldn’t be called iPhone Xs Plus as expected, but iPhone Xs Max. But subsequent leaks kept resurfacing the “Plus” moniker even though we exclusively confirmed the “Max” name. All that brings us to September 12th, 2018 A.D., just hours before Apple execs will take the stage to unveil a bunch of new products. 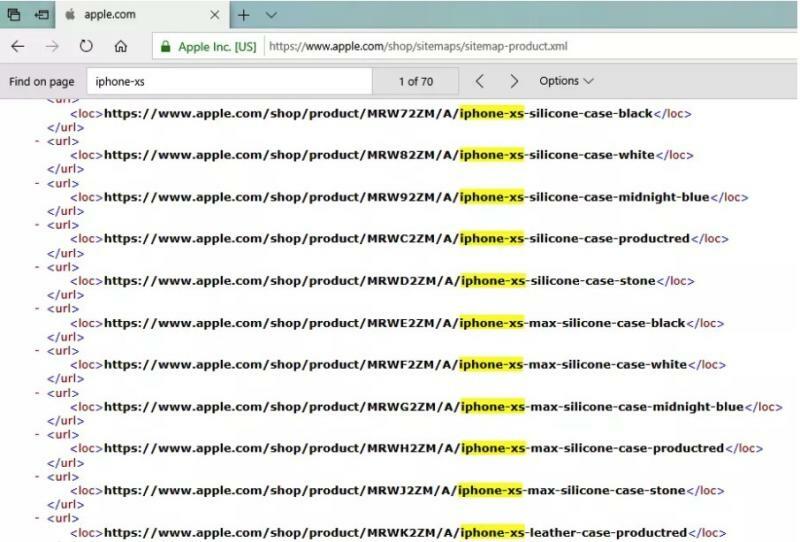 ATH discovered that the product sitemap XML file on Apple.com now contains the product names that will be used inside Apple’s online store, as well as product links. Beyond the names, 9to5Mac also noticed that Apple leaked all of its new iPhone Xr colors as well. The new lower-cost iPhone will be available in black, white, red, yellow, coral, and blue. We already know that the iPhone Xs and iPhone Xs Max will come in silver, space gray, and gold, so that takes care of every new iPhone color this year. Finally, the sitemap included mention of 512GB capacity for the iPhone Xs Max, which is another first for Apple. As such, we can expect Apple’s flagship iPhone models to come with up to 512GB, but the less expensive iPhone Xr will likely not be made available with that much storage. Apple’s event will start at 10:00 AM PT / 1:00 PM ET and will be streamed live on Apple’s site as well as on Apple’s Twitter profile. Will there be anything at all left to surprise us with? We doubt it, but we’ll obviously all tune in anyway.